Disney’s Coronado Springs Resort Convention Center would be the host for the APNA 29th Annual Conference in Orlando, Florida last October. Our Orlando video production company had the opportunity to document the premiere psychiatric mental health nursing conference. For the final product we would make promotional videos to promote future APNA annual conferences. During the trade show portion of the event, we shot interviews with some of the conference attendees who are current students, RNs, and APRNs about Psychiatric-Mental Health and to seek their opinions about the annual conference. We also got a chance to meet Brian Cuban, the brother of the NBA franchise Dallas Mavericks owner, Mark Cuban. 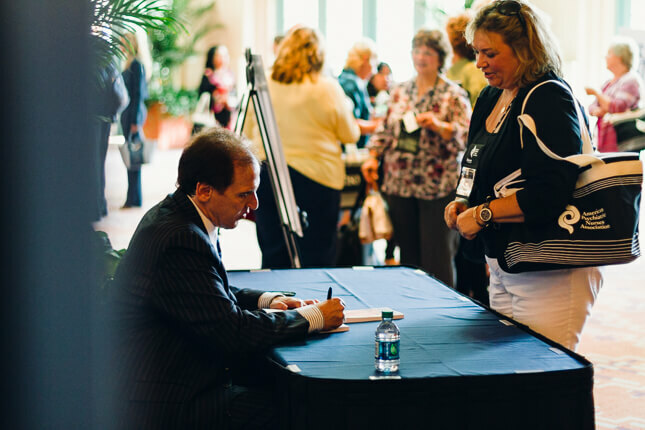 He was the keynote speaker and he also signed copies of his book after. He had quite the stories to share with the attendees of the APNA 29th Annual Conference. Mark Cuban is a great public speaker. Overall it was a great time capturing the APNA Annual Conference at Disney’s Coronado Springs Resort Convention Center. Being able to learn more about psychiatric and mental health nursing was quite the treat and an eye opener. We look forward to creative video ideas in the future about psychiatric and mental health nursing. Please do have a look at the APNA 29th Annual Conference testimonial and promo video that we produced for the American Psychiatric Nurses Association. We hope that you enjoy! The APNA Annual Conference delivers 100+ varied educational sessions and invaluable networking opportunities to the hundreds of psychiatric-mental health RNs and APRNs who attend each year. The annual event gives RNs and APRNs the opportunity to earn more than 25 continuing education contact hours onsite and an additional 100+ contact hours online afterwards. The American Psychiatric Nurses Association is a psychiatric mental health nursing organization based in Falls Church, VA. To Learn more information about the American Psychiatric Nurses Association, please visit their website APNA.org. A big thank you to the American Psychiatric Nurses Association for allowing us to capture your APNA 29th Annual Conference at Disney’s Coronado Springs Resort Convention Center in Orlando.